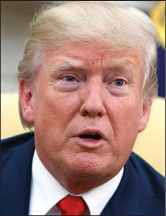 During his surprising ascent to power, “President Trump has enjoyed breaking the conventional rules of politics,” said Josh Dawsey in Politico.com. But in recent weeks, Trump has “flabbergasted” even his own aides by launching a war against his fellow Republicans in Congress. “Convinced the American public sees Congress as failing,” the president has publicly blamed Republican Senate Majority Leader Mitch McConnell for being unable to repeal Obamacare, and in a profanity-laced phone call privately raged at the Kentucky senator for not protecting him from the Russia investigation, according to a report in The New York Times. Trump has also fired salvos at Arizona Republican Sens. John McCain and Jeff Flake—threatening to find a candidate to primary the latter in the 2018 midterms—and attacked Sen. Bob Corker of Tennessee, a former close ally who publicly questioned the president’s “stability.” The Republican civil war may soon turn into a massive “political disaster,” said Chris Cillizza in CNN.com. Trump insisted last week he would veto any budget or debt-ceiling bill in September that didn’t include funding for his border wall. If Congress doesn’t raise the nation’s debt limit by Sept. 30, the federal government may shut down. “Believe me, if we have to close down the government, we’re building that wall!” Trump shouted at his rally in Phoenix, as his supporters roared. 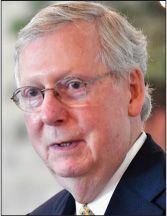 What else is Trump supposed to do, with establishment politicians like McConnell “obstructing the will of the people?” said Tammy Bruce in FoxNews.com. Voters sent Trump to the White House precisely so that he could shake up Washington and halt illegal immigration, stop the flow of jobs abroad, repeal and replace Obamacare, and improve national security. And yet the Republican-led Congress, which has an approval rating of just 10 percent, keeps standing in Trump’s way. If these lawmakers keep failing to do their jobs, Trump is right to call them out publicly and ask voters to punish them at the ballot box.